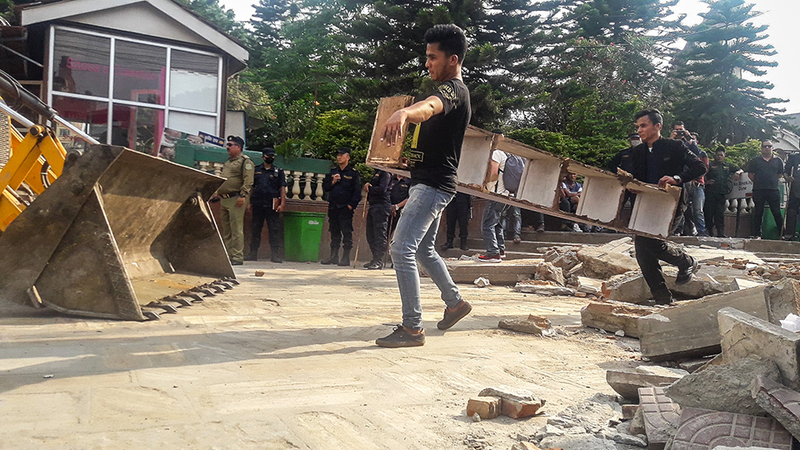 KATHMANDU, May 27: The Kathmandu Metropolitan City (KMC) Office has started demolishing the shops built on the premises of the Dharahara from Saturday, terminating its previous contracts with the shopkeepers. The move of the metropolitan city came a day after it issued an ultimatum to the shopkeepers. While bulldozers started demolishing the buildings meant for businesses, visibly angry shopkeepers were still busy shifting their items. Officials at the KMC said the police personnel of the KMC have been instructed to start clearing structures around Dharahara in order to start the reconstruction of the historical monument. About 100 personnel each from Kathmandu Metropolitan Police and Nepal Police were present at the site when the police personnel evacuated shops and restaurants starting 3 pm Saturday. 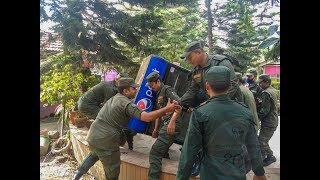 Police personnel had taken out various gadgets left in the buildings such as refrigerators, cooking utensils, chairs and tables. A meeting of KMC executive committee held on Friday had decided to demolish the buildings around Dharahara and had issued a notice to evacuate the shops so as to start the demolition process. It was mentioned in the notice that the contract between the shopkeepers and KMC was already terminated following the destruction of Dharahara on April 25, 2015. The decision was taken in light of the 15-day deadline given to KMC by National Reconstruction Authority (NEA) on May 10. Shopkeepers and restaurant owners have expressed dissatisfaction over the short ultimatum given by the KMC to evacuate their shops. Most of the shopkeepers could not decide what to do with their shop's merchandise by the end of the ultimatum. “24 hours is too short a period to evacuate a shop, let alone find a place to transfer the shop merchandise,” said Prakash Gyawali, a shop owner in the area. “It is like we are forced, not requested.” Gyawali is still undecided what to do with his shop's merchandise. Shopkeepers are hopeful that the construction will be as quick as the demolition. Most of them already knew that they would have to evacuate the building sooner or later but are unhappy that they had to evacuate their shops on a short notice.